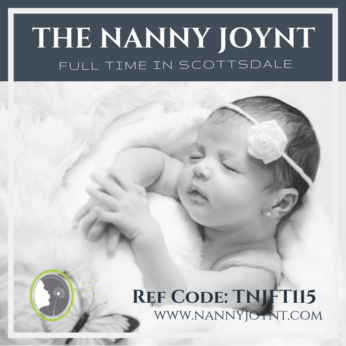 The Nanny Joynt is happy to share with you an amazing full time position in Scottsdale working with one infant baby girl. This family is looking for an excellent professional nanny who will be trustworthy, kind, caring and provide exceptional care for their almost 4 month old daughter. They would love for their new nanny to start on March 1st, 2019, the Grandmother will still be in town and will be leaving on April 9th. A nanny who can work alongside the Grandmother during the first month is needed. Their sweet little girl so far has been a very happy and easy going baby. She was born 2 months premature so a nanny who is invested in helping their daughter meet her milestones is imperative. They would like for their nanny to be patient, responsible and have extensive experience with infants! This position will be full time, 40 – 45 hours per week. Monday through Friday 9:00am until 6:00pm with flexibility to stay late on occasion. A parent is usually home no later than 6:30pm each evening. Both parents work outside of the home and sometimes have appointments that run a little late. This position offers guaranteed hours, paid vacation, paid holidays, paid sick time and is offering $20 – $25 per hour depending on experience and qualifications. These first time parents are kind, open, laid back and easy going. They are a bit nervous about hiring a nanny for the first time and would prefer a nanny who is open to staying at the home each day. As the baby gets older and trust is established the will be open to walks, parks, and possibly outings. A creative nanny who will find things to do around their home is ideal. Mom would love receiving texts and photos during the day so she can take a peek at her little one while she is at work. The ideal candidate for this position will be happy, engaging, attentive, organized, flexible, and has good judgement. This family would like to have full trust in their nanny to take care of their daughter on a daily basis without having to micromanage as they both work very intense jobs. A nanny who is professional, proactive and very loving is what this family is looking for. Child related duties will include all care for their daughter. Feeding, diapers, naps, keeping a daily log and making sure that her needs are attended to. Tummy time, educational activities, helping their daughter meet her developmental milestones and actively engaging with her each day. Reading, music and singing to her. Exceptional care of their little one is top priority! Household responsibilities will include children’s laundry, load/unload dishwasher, child related dishes, tidying and making sure the babies areas are clean and organized. This family does employ a housekeeper who comes 2 times per month for deep cleaning. They want the focus to always be on the the care of their daughter and not on the home. If baby is napping assistance around the house would be appreciated. This is a sweet and friendly family who wants to build a long lasting partnership with their new nanny! They enjoy family time and are very excited to meet their new nanny who they hope will become an active part of their family! This is a busy professional couple who wants a nanny they can rely on to take of their baby girl with the utmost love and care and be an extension of them while they are at work. Nannies, this is truly an incredible position and we are seeking the BEST of the best for them. If you are looking for a long term career position, this is the job for you! To be considered for this fantastic opportunity please email your resume to trisha@nannyjoynt.complease use Reference code – TNJFT115 in the subject line.